Forget homemade pastry - these fuss-free crostades make great appetizers. Fill with one of our savoury fillings and get the party started. TRIM crusts from 24 slices soft bread. Flatten with rolling pin to 1/4 inch thickness. Brush both sides with melted butter. Press whole slice of bread lightly into muffin tins. Bake at 350°F for 15 minutes or until golden. Add filling and serve. Bruschetta: Mix 1 cup chopped, seeded tomato, 1/4 cup each Miracle Whip Spread, Kraft Grated Parmesan , chopped black olives & 1 tsp each dried basil leaves and minced fresh garlic. Vegetable: Mix 1/2 cup each chopped red peppers & cucumber, 1/4 cup each chopped green onion and Miracle Whip Spread and 1 tsp. each dried oregano and mint. 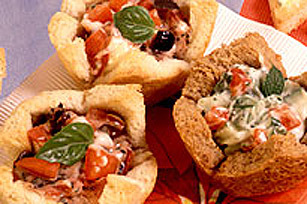 Unfilled croustade shells can be made ahead and frozen.